Hi Guys, I hope you are having a lovely Easter weekend. 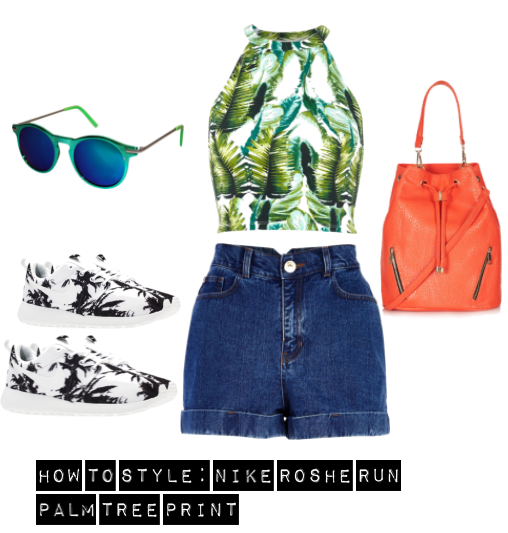 I thought I would do a "How to style themed post" to give you inspiration on how to style Nike Roshe Run Palm Print sneakers 4 ways. These trainers are inspired by the practice of meditation and the concept of Zen and epitomises simplicity with black palm trees printed on a white back drop; giving a tranquil zen garden feel. The Roshe Run is a lightweight runner constructed of a breathable mesh and a super soft midsole. The trainers definitely represent warm weather in a graphical, wearable, fun & playful way. As you can tell in previous posts here, here & here, I have incorporated the fly palm tree sneakers in numerous of my casual outfits. The trainers have become increasingly popular and as it stands are no longer available online at Office or NIKE.com. So perhaps looking in your nearest local Office, Nike, Size and OffSpring store, you might just find there; otherwise another retailer or reputable Ebay seller. Great options, love the white and leach combo. Love the options, especially the third one. The Nikes are so cool.